Fire is the great killer of ships, even more so than flooding. You would think a modern ship, made of steel, wouldn’t burn so well. But a ship is far more than a collection of steel plate. Fuel, furnishings, paint, insulation, electrical cables, lubricants, ammunition, bedding and linens, rope and cordage, virtually everything on a ship is flammable to some degree. Recent experience with the USS Stark, HMS Sheffield, and the M/V Atlantic Conveyor all show the challenges of fighting fires aboard ship. For that matter, USS George Washington was seriously damaged by a fire a few years ago. Not surprisingly, the Navy devotes considerable training to all its shipboard personnel in firefighting, starting in Boot Camp and continuing with drills aboard ships of the fleet. Even your humble scribe has partaken of some of the training. What I didn’t know was that the US Navy actually has a ship dedicated to firefighting research. The ex-USS Shadwell started life during World War II as one of the first Landing Ship Docks built to transport landing craft to the assault areas. Essentially a self propelled floating drydock, the US built 17 LSDs during World War II, with four going to the British. The USS Shadwell suffered a torpedo hit in early 1945 that nearly sank her, but incredibly only caused minor injuries to three crewmen. Through incredible damage control efforts, the crew saved her, and eventually brought her home to the US for repairs. Reaching the western Pacific just in time for the end of hostilities, she would soon after be decommissioned and laid up in ordinary. Recommissioned during the Korean War, she would go on to a fairly routine career with the Atlantic Fleet, decommissioning again in 1971, being stricken from the Naval Register, and awaiting disposal. But rather than being sold for scrap or sunk as a target like so many other wartime ships, in 1988, the ex-USS Shadwell was moved to Little Sand Island, on Mobile Bay, where she became a test bed for firefighting techniques and technologies, a role she performs to this day. Via Chris’ link, there’s a neat little write up and video at All Hands magazine showcasing the old girl. To say the Navy has gotten its money’s worth out of her is something of an understatement. 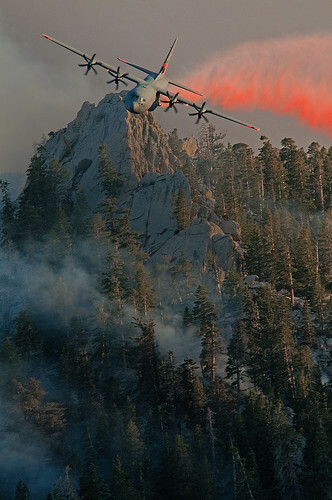 A C-130J Hercules aircraft releases fire retardant over the trees in the mountains above Palm Springs, Calif., July 19. The 146th Airlift Wing, a California Air National Guard unit, was activated to assist the community with wildfires. I was actually out of town when this particular mission was flown, but the smoke from the Mountain Fire was quite visible from I-10 as we drove back into town. In addition to the C-130, two modified DC-10 tankers and a slew of other fixed wing and rotary wing air attack aircraft, dozens of fire engines, and 3000 firefighters struggled to contain the blaze and save the charming town of Idyllwild. Since Byron mentioned Damage Control in the comments, I thought I’d repost this from the early days of the blog. I’ve just finished reading Sailors to the End, a book that tells the story of the tragic fire aboard the U.S.S. Forrestal in July, 1967. I didn’t find the book all that well written, which is a shame because the valor of the sailors on that ship is a tale that should be told far and wide. On July 29, 1967, while the Forrestal was preparing for her second airstrike of the day, a Zuni 5″ rocket was accidently fired from an F-4 Phantom parked on the port side of the ship. The rocket zoomed across the flight deck, struck a hapless crewman, severed his arm, flew onward and struck John McCain’s A-4 Skyhawk light attack jet. The rocket ruptured the fuel tank of the Skyhawk and bits of propellant from the rocket ignited the fuel. 400 gallons of hot burning JP-5 jet fuel was suddenly ablaze and being fanned by the 27 knot wind across the deck. 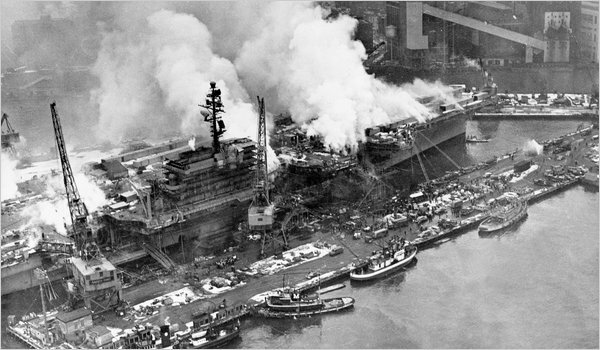 Almost instantly, Repair 8, the dedicated firefighting team on the flight deck, rushed into action. The fire on the flight deck was large and dangerous, but might have been quickly contained. Tragically, the 1000 pound bombs carried by the Skyhawks that day were old and not as resistant to heat as later weapons. Ninety-four seconds after the fire started, the first of nine 1000 pound bombs exploded. The damage was horrific. 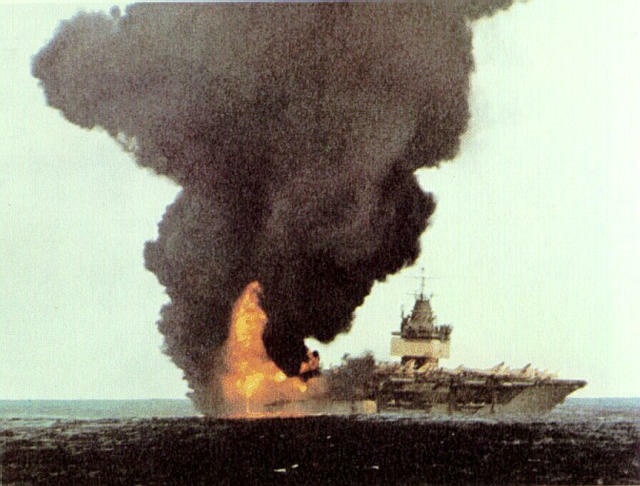 The explosion decimated Repair 8, leaving the flight deck with almost no trained personnel to fight the fire. The blast also shattered other aircraft, spreading even more burning jet fuel to feed the inferno. The blast punched a hole through the 1 3/4″ flight deck, allowing burning jet fuel to pour into the compartments below. Directly beneath the blast was a berthing compartment. Many crewmen were instantly killed by the first blast, before they even had a chance to rush to their battle stations. On a ship on fire, there is really no place to run to. Young men, many with no training in firefighting, rushed to replace their fallen comrades and battle the fire. Others worked to save the wounded, jettison bombs and other ordnance before it too exploded, or push damaged aircraft over the side before they were engulfed. Many lives were lost through a lack of training, and the fire lasted longer than it should have because of poor firefighting techniques. There was no lack of courage, but skill was sorely in need. As a result of the fire, 134 sailors lost their lives and 161 were injured badly enough to require treatment, many of them suffering terrible burns. In response to the tragedy and others like it, including the fires on the Oriskany in 1966 and the Enterprise in 1969, the Navy revamped the way it trained people on carriers. Before, dedicated damage control teams were trained in firefighting. Now, anyone who serves on the flight deck of a carrier has to recieve at least rudimentary training on flight and hangar deck firefighting. And that’s where I come in. When I was a wee lad, I was in Sea Scouts, a part of the Boy Scouts of America. One of my fellow Scouts was the son of the fire chief at the Navy base where I grew up. His father secured three slots for us to attend the firefighting course. I was 15. On the appointed day, my friend Eric, another Scout named Karl, and I showed up in a classroom in a converted WWII barracks for an intense 2 day familiarization course on firefighting on a carrier flight deck. The first day was mostly classroom stuff, and the full version of the film above was central to the training. One of the (many) reasons I never considered joining the Navy was the recitation of the many and varied ways that you could wind up dead on a carrier. Walking into a jet intake, being blown down the flight deck or overboard by a jet’s exhaust, walking into a prop, just walking off the edge of the carrier, being hit by an arresting wire, being run over by a plane or one of the flight deck tractors. That’s just a taste of the ways to wind up dead. Makes the infantry look safe. Day two was when the fun started. Instead of the classroom, we got to experience the practical application side. The school had a “fire range” set up on base. It looked a lot like two Olympic sized swimming pools, only it was 6 inches deep. They would flood the pool with jet fuel, gas, diesel and whatever other flammable liquids they could find. And set it on fire. They would give it a minute or so to get going really well. Then we, the students would attack the fire. Now, when you see firefighters, they have all the heavy fireproof clothing and masks and helmets and whatnot. We didn’t. We had on standard Navy dungaree uniforms, ball caps, heavy bunker coats ( as a modest nod toward our safety) and cotton gloves. And instead of fighting the fires with AFFF (aqueous film forming foam) we used plain old water. Generally, there were two teams, each with two hoses. One hose in each team would send a spray of fog over the entire team. This kept the heat away from our pink little bodies. The other hose was the attack hose, with a moderate jet of water sweeping back and forth to push back the burning jet fuel. Both hose teams had to work in conjunction to push the fire back and extinguish it. If the teams didn’t coordinate closely, a gap would open between them and the fuel between them would reignite in a flashback. And suddenly, we would find ourselves in the middle of a very big, very hot fire. It happened once or twice and it was unpleasant. That’s when the fog hose really came into play. Of course, one of the things they pounded into our heads was “94 seconds”. That was all the time you could expect to have to get cooling water onto ordnance. Speed is life. After maybe a dozen forays into the flames, we became somewhat proficient. Not fully trained firefighters, no. But fire no longer held a terror that it might once have. As an aside, when searching for graphics and video for this post, I see that a bunch of nutjobs are spreading a smear that John McCain was responsible for the fire. This is an utter lie, debunked so many times that it isn’t funny. But that won’t stop liars from lying. McCain’s actions that day weren’t particularly heroic, but they were in no way dishonorable either. His presence in the aircraft that was struck by the rocket is just one of those odd coincidences that make history so interesting. Author XBradTC2Posted on April 13, 2009 Categories ARMY TRAINING, Around the web, ducks, guns, PersonalTags ducks, fire, food, guns3 Comments on WANT!! Lets Go To A-10 School! We’ve talked about the A-10 and the GAU-8 30mm cannon before. And we’ll talk about it some more in the future. Pretty much every time we find a cool video, that’s what we’ll do. Author XBradTC2Posted on March 21, 2009 Categories Afghanistan, armor, army, ARMY TRAINING, gunsTags Afghanistan, air force, army, army life, ARMY TRAINING, fire, guns, iraq, machine guns, war10 Comments on Lets Go To A-10 School! Well, there’s a shock… not. Israeli newspaper Haaretz is reporting a barrage of Katyusha rockets has struck a nursing home in the Israeli town of Nahariya. In response to the three rockets fired from Lebanon, Israeli forces fired five rounds of artillery at the launch point. As for the political implications of this attack in the north, we’ll wait to see what tomorrow brings. Update: Hezbollah denies firing the riockets. It was probably a Hezbollah inspired proxy group. So far it looks like a nuisance attack, and not the start of a campaign. Author XBradTC2Posted on January 7, 2009 Categories army, ARMY TRAINING, guns, israelTags army, ARMY TRAINING, artillery, fire, gaza, guns, israel, Politics, war1 Comment on Well, there’s a shock… not.